In this episode of “Weird Qualities That Jessica Possesses” we learn that she doesn’t really like bread. And we learn that possesses has a heck of a lot of s’s. It’s not that I don’t LIKE it. I do. It’s just not the first thing I think of when I’m all OMGIneedfoodnow. I’m simply not a bread person and can easily pass up the dinner basket unless I’m starvvvving. Which yeah… feels like all the time. But still, I prefer to think of bread as a vehicle for something much more delicious. Like smashed avocado with sea salt and lime. Or a plate full of olive oil sprinkled with parmesan cheese and minced garlic. Or really creamy peanut butter with a layer of melted chocolate chips. Or melty brie topped with macerated strawberries. Or even… cut into little cubes and mixed with bacon and other delicious bites then doused with gravy on that thing we call Thanksgiving. That’s what I think of bready stuff. And believe me, I thank my lucky stars that I don’t have the bread addiction like so many others, but I MORE than make up for it with a cheesecake, cookie, pizza and mac and cheese addiction. Pick your poison. Now the kicker: things like buttermilk biscuits, cornbread and banana bread don’t really fall under those specifications because, well… they are buttermilk biscuits, cornbread and banana bread. If right about now you are thinking “wow, this chick is seriously high maintenance and I feel bad for those within a 16 mile radius of her”… then you are certainly right. Last week I stopped by my parents’ house and on the counter I spied a BAG full of asiago bagels. After I checked the fridge… of course. That’s always the very first thing I do. Obviously. But wait… why do parents always have the best food? Why do things taste like five kajillion times better at their house? Why do I want to consume food that I normally don’t even care about when I visit, like gumdrops and buttered rum muffins and two-week old cold pizza and stale-but-buttery Ritz crackers? 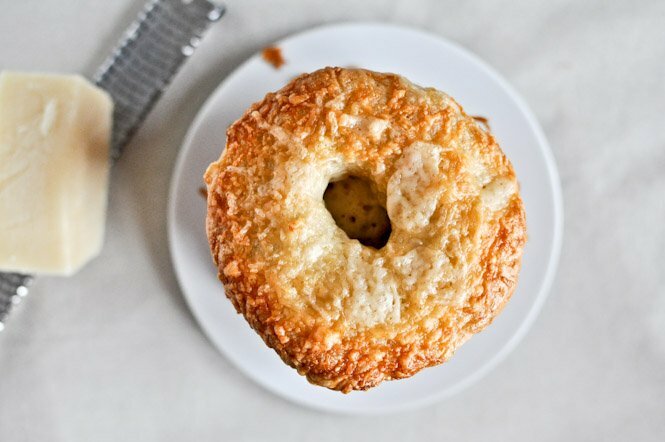 If I love bagels, I love asiago cheese bagels like sixty times more. If I found it feasible to waste a day’s worth of calories on bread alone, I would trek to Panera every single freaking day. Oh but wait. I don’t have to. Because I MADE MY OWN. And they are easy. Promise. Super promise. It only took me four or five tries, which yeah, was a massive pain, but now? 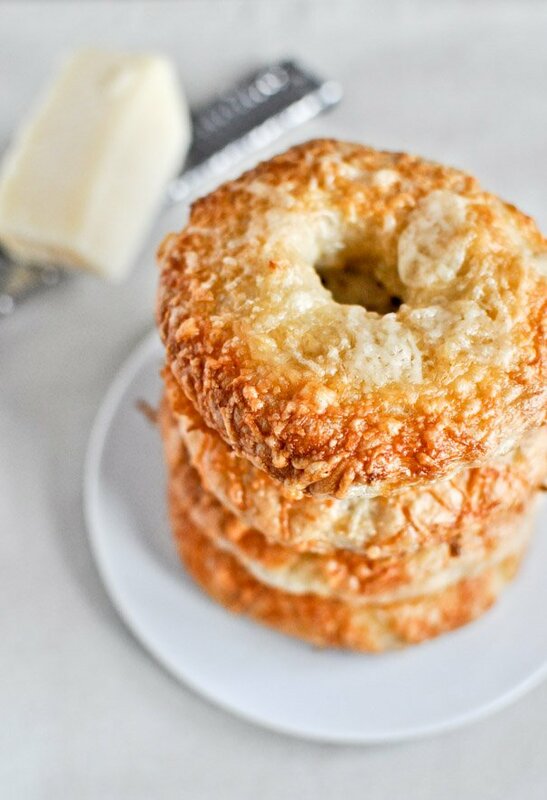 I have asiago cheese bagels for life. Still trying to figure out if this is a wonderful or terrifying thing. Halllllp me. Pingback: Why Aren’t More People Making These?! I made these today and they turned out great! Thanks so much for the recipe. Just wondering–did you coat both sides with the asiago cheese? Love this recipe! 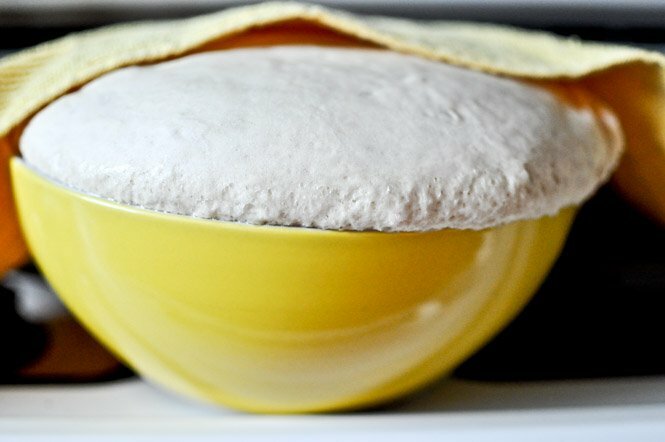 Do you think I could add in like 1/2 tsp of garlic powder when forming the dough? 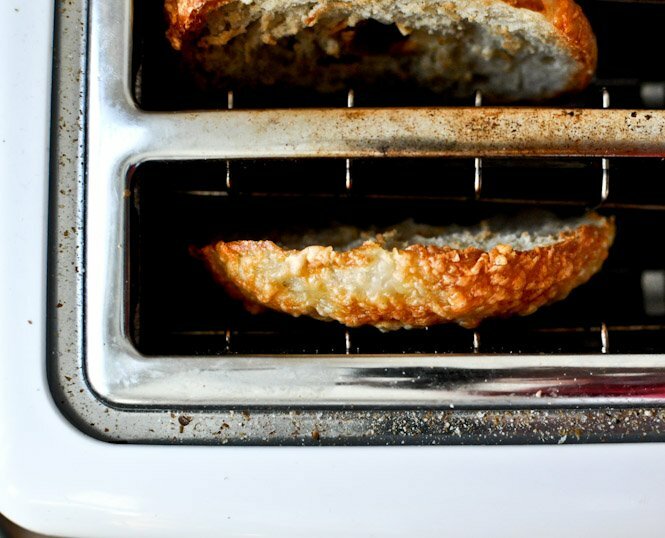 Or maybe brush some minced garlic in oil onto the bagels before adding the cheese and shoving them in the oven? Or both?!?? I plan on liberally covering these in chive & onion cream cheese so this may be too much flavor…but I would love to hear your take! I’ve loved asiago bagels from Au Bon Pain. These sound and look divine. I haven’t baked anything in some time, but these might lure me back to the oven. Thanks for sharing the recipe! I love the look of these!! 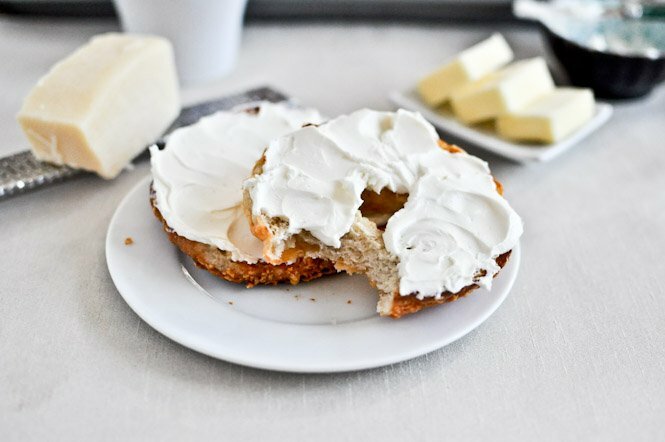 I’ve now made homemade bagels three times now and want to attempt these – your recipe has you using a mixer with a dough hook – I just use my bare hands (as I don’t have that type of mixer) – I assume it’ll still come out ok? 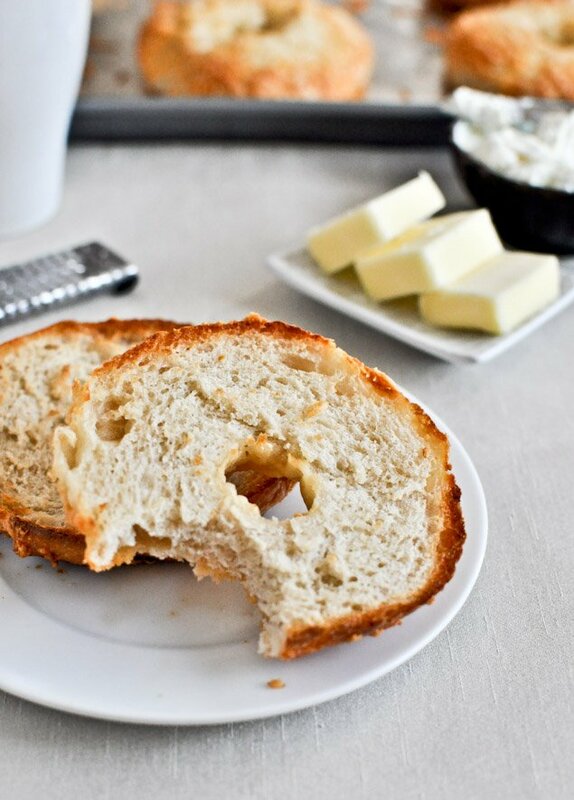 These bagels are the BEST! Very easy to make and taste like store bought. Thank you for such a great recipe! These look so delicious! I want to try them with cheddar! So creeping on posts over four years old but that’s beside the point. sooooooo much better than store bought! I would like to try you bagel recipe but there is no PRINT option! HELP! !